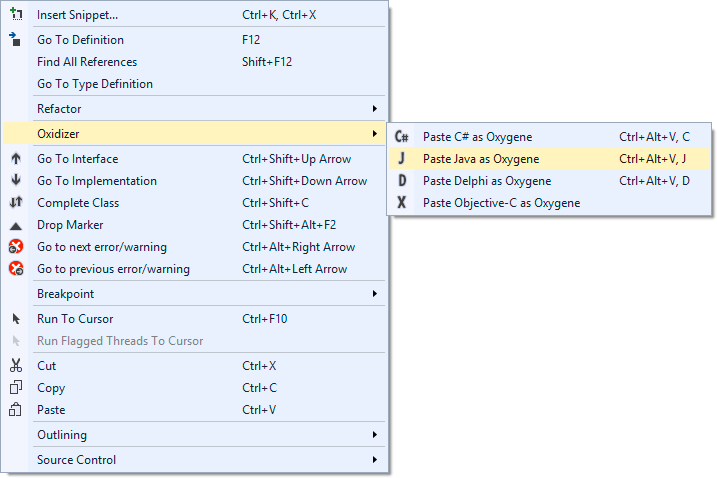 Oxidizer is integrated directly with the clipboard/pasteboard operations of the code editor in both Fire and Visual Studio to allow you to convert code snippets on the fly, while pasting them into your project. Simply copy a piece of C#, Objective-C, Java, Swift or Delphi code from an existing source (e.g. from a sample project or an article you found on the web), and then select the appropriate "Paste" option from the menu. You only need to pick the right source language your original code is in, as Oxidizer will already know what the target language is, based on the current source file. Note that not all source languages are available, based on the target language (for example, Delphi code can only be converted to Oxygene, and converting C# to C# or Swift to Swift makes little sense, of course).